These heavy duty plastic forks are strong and shatter resistant. They are top quality and will hold up to most meals. Great for the outdoors person, take these plastic forks along with you on your hike or camping trip. They're light in weight and extra durable too. 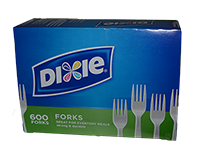 These disposable plastic forks are great for picnics, family reunions, social events and summer parties. Keeps these plastic forks handy in your office breakroom for your employees. Disposable, and sanitary, there's no need to was these utensils.